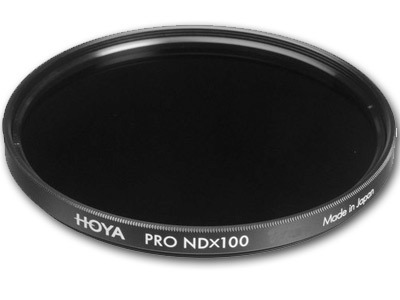 The Hoya ProND100 Filter is a solid neutral density filter that enables a 6.6-stop increase in exposure. This 2.0 density creates a darkening of the entire image, allowing you to photograph with a wider aperture or slower shutter speed than normally required. By slowing your exposure time or increasing your aperture, you are able to control depth of field and convey movement more easily. This filter employs Hoya's metallic ACCU-ND coating on both sides of the substrate to create the neutral density effect and ensure maintained colour neutrality between filter grades. It is constructed from high-quality clear optical glass for notable image clarity and is set within a durable one-piece aluminum filter ring. 2.0 ND filter darkens the image, allowing you to photograph with a longer shutter speed or wider aperture than normally required. Providing a 6.6-stop reduction, this filter allows you to control depth of field and convey movement more easily.